Soldier 2: Do you want any gravy, sir? That brilliant line is enough to show that Catherine Tate and Little Britain are for me still miles away from the Two Ronnies. 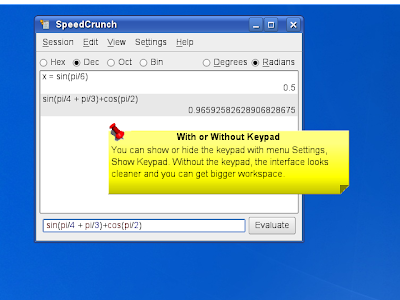 If the download counter is correct, we have already more than 11,000 downloads for SpeedCrunch 0.7, the latest stable release. And this of course doesn't include installation via package manager (from apt to pirut). Not bad, considered it's just released over 2 months ago. But it's all about "release early, relase often", right? So now the SpeedCrunch team has just announced the first alpha for version 0.8. There is Win32 installer and the source code is known to build on Debian Etch, Gentoo and SUSE 10.2. Helder, the new maintainer, aims for a final release at the end of this month. So we have a month of bug fixing session. There are couple of new features in this 0.8. Most of them are features suggested by you. Since the documentation is not ready yet (will be for final release of course), I thought it's worth mentioning here that the radio button only changes the formatting of the values shown in the display, not how you type in the expression. If you want to enter an expression containing hex number, you should prefix with 0x. For octal it's 0o and for binary it's 0b. So, you are allowed to do something like: 0xfe + 1, i.e. mixing between hex and decimal. The result will be shown as 255 or 0xff, depends on what you choose in that radix radio button. Beside that, there are also other new goodies, like tons of new functions, factorial operator, choices for decimal point (auto/comma/dot), engineering notation, case-sensitivity for variable names, and assorted bug fixes. You can also have non-modal, docked/floating lists to display built-in functions, variables, constants, and history. Remember, this is alpha, so there are rough edges here and there. But if you feel brave, just get it while it's hot!